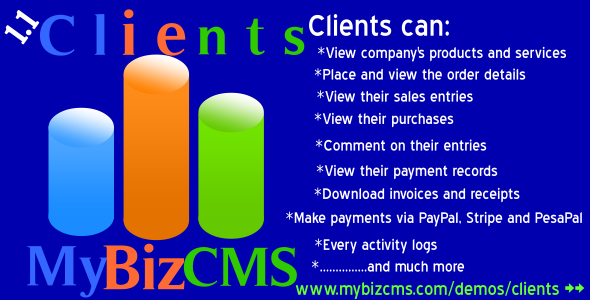 MyBizCMS Clients Addon adds more clients functionality to its predecessor (MyBizCMS). Let your clients place orders for your products and services, see their entries and payment records. Now clients can comment on their entries and make secure payments on them through PayPal or PesaPal. View company’s products and services. Place and view their orders. Make secure payments through PayPal, Stripe and PesaPal. Improved security on PesaPal payment method. Better looking and attractive products slideshows.